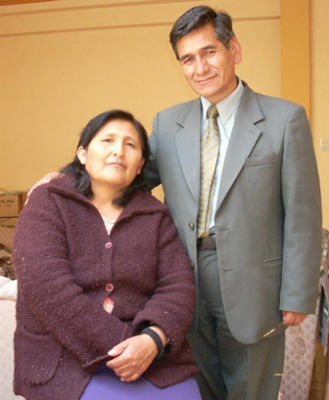 Photo: Victor and Estela Quispe at their home in La Paz. Victor H. Quispe, president of the Inter-American Confraternity of the Church of God, is recuperating at the hospital in Bolivia after suffering a traffic accident in the wee hours of Saturday, December 17. Quispe was traveling in an inter-urban taxi from La Paz to the city of Oruro to participate in weekend evangelistic campaigns when the accident occurred. “It happened at 12:15 AM, a little after midnight,” Quispe explained in phone call from his room at the Natividad Clinic, where he remained hospitalized at press time. “The driver fell asleep and the station wagon in which we were traveling left the highway. It then returned to the pavement, and rolled over three times. Brother Quispe suffered cracked ribs in his back and damage to his right lung. He is currently hospitalized for observation and treatment. He hopes to be released in the next few days to return home and celebrate Christmas with his family. Meanwhile, prayer is requested for his complete recovery. “We also ask for prayer for preparations for the IAC in April,” Quispe said. The 26th Inter-American Conference of the Church of God will be held in Bolivia from April 11 to 17, 2017. As president of the IAC, Quispe is tasked with organizing the biannual event, along with Alberto Martinez of Chile (treasurer), and Esteban Zapata of Honduras (secretary). Connect with the Church of God around the world: visit www.chogglobal.org. This entry was posted in All Church of God, Global Strategy and tagged Bolivia, David Miller, La Paz, Latin America, missions, prayer request, traffic accident, Victor Quispe. Bookmark the permalink.